Toshiba is expanding their portfolio of 24nm single-level cell (SLC) NAND flash memory to include a new 16 gigabit (Gb) BENAND™ module. The new version is housed in an industry-standard 48-pin TSOP package, and provides high read/write performance, superior write endurance (with 8-bit BCH error correction code), as well as an extended range of operating temperatures, making it an excellent choice for a wide range of industrial and commercial usage scenarios. 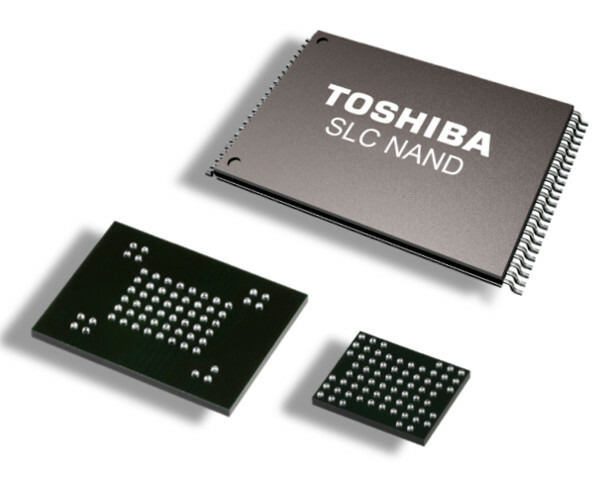 This latest addition to Toshiba’s BENAND lineup enables designers to take full advantage of BENAND’s price-to-performance ratio of 24nm SLC flash technology in capacities from 1Gb to 128Gb. Created on a 4x4Gb die, the 16Gb BENAND operates in a power range of 2.7V to 3.3V, and with an operating temperature range of -40°C to 85°C. Most industrial usage scenarios require a long life expectancy, so Toshiba has designed BENAND taking this into consideration. BENAND can replace older generations of discrete SLC NAND, effectively extending the product lifespan for everything from LCD TVs and telecom applications to printers and robots, and usually at a lower bill-of-materials (BOM) cost. One advantage to Toshiba’s 24nm BENAND is that it requires no ECC from the host controller, allowing it to be utilized even with host controllers that do not support 8-bit ECC capabilities. This makes it an excellent option for companies seeking to design in a next-generation NAND solution, yet utilizing existing hardware. BENAND’s features, including page/block size, spare area size, interface, commands and package are identical to legacy 24nm SLC NAND, enabling simplified migration to the newer BENAND. Toshiba remains committed to the support of 24nm SLC NAND flash, giving industrial designers the confidence to realize that they have selected the right technology for their chosen applications that require product longevity, eliminating many of the concerns of redesigning to newer generations. You can view the BENAND product page here, as well as the Toshiba press release announcing the 16Gb 24nm BENAND in its entirety here.